Digital commerce is steadily becoming the primary enterprise system for customer engagement. The number of digital touchpoints and channels continues to grow exponentially as consumers become fully digital. Airlines are increasingly focused on investment in fully integrated digital commerce platforms which accelerate distribution efficiencies, deliver higher conversion and attachment rates, and promote differentiated and personalized digital self-service at all touchpoints in the customer journey. Unified commerce systems must deliver an unprecedented level of control and agility to support offer and order management across rapidly evolving channels and points of sale, but they must also support and enable an ever-expanding ecosystem of developers, partner suppliers and enterprise systems. The dichotomy of B2B and B2C continues to converge to C2B markets as airlines become consumer driven businesses accessible across a proliferation of new digital channels. Airlines will need to compete and differentiate product offerings across these channels at a pace never before imagined. For some the transition has been a slow, painful process constrained by legacy systems designed to support a thirty year old supply chain model no longer fit for purpose. Digital commerce can no longer be viewed as a sub component of a legacy enterprise system. To innovate at a pace the consumer dictates, airlines must re-platform to ‘best of breed’ digital commerce solutions delivered as an API platform which enables seamless integration yet also abstracts from limitations of legacy enterprise systems. Airlines are investing substantially in the design of the digital experience across connected touchpoints used across the customer journey. Application developers require access to digital commerce solutions that offer robust API developer tool sets to rapidly develop and innovate the digital retail experience and deliver real-time business insights for real-time retail decisions. Airline partner merchants extend the airline retail offering to incorporate value add products and services which fulfill the dynamic demand requirements of the customer. Whether hotel, ground transport or car rental, integrated commerce strategies must embrace ‘API First’ and deliver robust tool sets for usability, configurability, extensibility and integration to their partner merchants. • Are consumers frustrated with your digital shopping experience? • Can you put control of the digital experience in the hands of users to respond to changing market dynamics? • Is your digital commerce platform open to value-add system and content partners that can accelerate and innovate your offerings? • Can your developers access robust tools which abstract from the constraints of legacy systems to innovate at pace. • Do you have a commerce infrastructure providing unified pricing, offer and order management and which will scale to become your primary system for customer engagement? • Will your existing security infrastructure scale to support millions of “things” connected to the Internet? • Are you capable of introducing new authentication and authorization patterns as required for connected devices? To unify and differentiate the consumer experience across an increasingly digital marketplace requires a unified commerce framework for all offer and order management across all channels. Yet this must be delivered using an API First technology strategy which is flexible and agile to support a digital ecosystem of providers and partners. 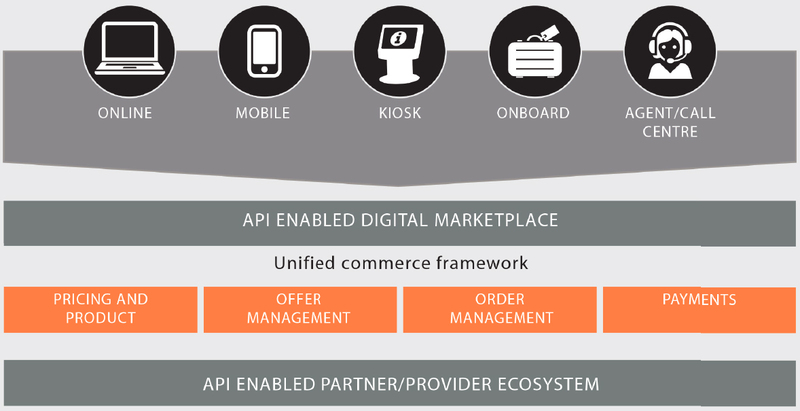 Digital commerce delivered as API First will reduce the complexity and effort required to support providers and partners in a consistent and performant manner, enabling the agility needed to embrace the disruptive digital consumer trends and embrace new digital channels which will demand continual and rapid shifts in direction. This is aligned with the IATA Simplifying the Business (StB) strategy and vision for NDC and One Order.